My PhD is focused on the electrophysiological basis of auditory verbal hallucinations, in other words what is happening in the brain when people are hearing voices. Such hallucinatory experiences are often associated with psychiatric conditions, such as schizophrenia, however this phenomena is far more common amongst the general population than one might think. I am primarily interested in whether the brain basis of hearing voices is the same across these groups and what this can tell use about our concept of auditory verbal hallucinations as a symptom of a psychiatric disorder. I am working with electroencephalography (EEG) which is a technique that measures the electrical activity of the brain using electrodes placed on the scalp. A further aim of my PhD is to identify potential neural markers for use in neurofeedback, a type of biofeedback therapy that uses real-time displays of brain activity to teach self-regulation of brain function. I chose the MRC DTP as I was primarily interested in the research opportunities offered. 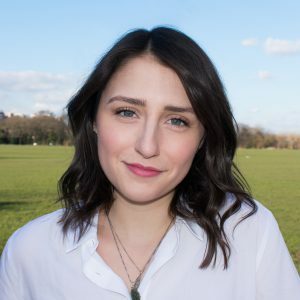 Prior to applying for the PhD, I was interested in going into psychiatric research and, due to its long-standing reputation in this area, KCL was a natural choice. I was happy to find that the MRC DTP offered many projects that suited my interests. I am very happy with the project I chose and have found there is certainly a lot of space for me to be creative and take it in the direction I am most interested in. Since joining the MRC DTP I have also appreciated the extensive amount of research and career workshops offered by the program and KCL, which have been useful for navigating the first year of my PhD. Prior to joining the MRC DTP, I completed a BSc in Biology with Psychology at Queen Mary University, and an MRes in Cognitive Neuroscience at UCL. I also spent time working at the Institute of Experimental Medicine at the Czech Academy of Sciences, before returning to UCL as a research assistant at the Institute of Cognitive Neuroscience. Wen, W., Brann, E., Di Costa, S., & Haggard, P. (in press). Enhanced perceptual processing of self-generated motion: Evidence from steady-state visual evoked potentials. Neuroimage. My PhD research feeds into the wider interests of the Cultural and Social Neuroscience group, which is an intercollegiate research group that investigates the cultural, social, and neurocognitive processes contributing to variations in belief and experience in illness and health. On our website you will find information about our work as well as our blog, to which I am a regular contributor (www.csnlab.co.uk). I am also involved in Postdocalypse, a KCL based podcast run by postgraduate students in which we discuss all things postgrad! My personal website and blog (www.elisabrann.wordpress.com) includes regular updates and information about my research interests and publications, as well as my musings about PhD life.